Here at the Total Security Daily Advisor, we are busy gearing up for this year’s Workplace Violence Prevention Symposium. Last week, our sister publication, the EHS Daily Advisor was lucky enough to chat with Patrick Prince, who is presenting an educational session at the symposium, for the EHS on Tap podcast. Below, you’ll find part one of the chat with Prince, where he outlines types of workplace violence threats, some common misconceptions, and the potential connections of workplace violence to substance abuse. Additionally, Prince suggests, we too often focus on the loudest person in the room, which leads us to miss the real indicators of a pending workplace violence incident. If you would rather listen to their discussion, you can find the audio here. Justin Scace: Hello, everyone, and welcome back to EHS on Tap. We hope that you all had a safe and healthy holiday season and a great start to 2019. We certainly are all ready to go with a new year of expert guests delivering best practices and insights into the environment, health, and safety industry. I’m your host, Justin Scace, senior editor of the EHS Daily Advisor and Safety Decisions magazine. Now, the threat from workplace violence is very real, and employers simply can’t afford to ignore it. Hopefully, you already have a workplace violence prevention program in place, and if not, you’re steadily working toward implementing one. The issue is multi-faceted, touching upon everything from active shooters to coworker conflicts to domestic violence spillover. Our guest on today’s episode is here to talk about another angle of the problem that you may not have considered. We’re talking about the intersection of workplace violence with another common organizational concern: Substance abuse. Joining us today on EHS on Tap is Patrick Prince, the associate vice provost and chief threat assessment officer for the University of Southern California. In addition to his role at USC, Patrick is a standing member of corporate threat assessment teams for several Fortune 500 companies, as well as numerous cities and government agencies. He has consulted on more than 2,800 cases dealing with a wide array of situations, ranging from intimidation, harassment, and verbal threats, to physical assaults, acts of sabotage, felony stalking, discharging firearms in the workplace, and even on-the-job homicide. Patrick will be presenting an educational session, “Substance Abuse and Workplace Violence: Understanding the Impact and Addressing the Risk,” at BLR’s upcoming 2019 Workplace Violence Prevention Symposium, taking place March 14th through 15th in San Antonio, Texas. Patrick, thank you so much for joining us on the podcast today. Patrick Prince: It’s my pleasure. Thank you for having me. Justin Scace: Absolutely. Tell us a little bit about what you do as associate vice provost and chief threat assessment officer at USC. What sorts of risks are you on the lookout for? Patrick Prince: Well, my job in general is to provide proactive, collaborative oversight and support throughout the university. We have to identify, assess potential risks, and manage threats and/or threatening behavior that might lead to acts of targeted violence. My role is to assist the university across all elements to hopefully identify problems before they become overwhelming, to craft intervention opportunities, and to resolve issues, and hopefully then prevent violence from occurring within our community. Justin Scace: Okay. Great. What are some key warning signs that indicate the potential for a workplace violence incident? Patrick Prince: First, let me reframe my position a little bit, inasmuch as I’ve been at USC now for almost two years. Prior to that, I spent over 25 years working with corporate entities, identifying potential violence, responding to incidents, and one of the great challenges that we have is when we talk about workplace violence, there are different sources, and each source really has a different way of presenting itself. For example, we can go back as far as 1993 when OSHA first started publishing on this, and OSHA identified, I think it was actually published in ’94, types one (criminal), two (customer/client), three (worker-on-worker), and four (personal relationship). These are the potential sources of violence. Type one, the criminal. The person has no relationship. We now look for vulnerabilities for exposure. Do we have money? Do we have exposure to the public? Do we have opportunities for people to enter into our arenas? And so what we look for there are vulnerabilities for mostly criminal or other folks who may come into the environment and take advantage of it. 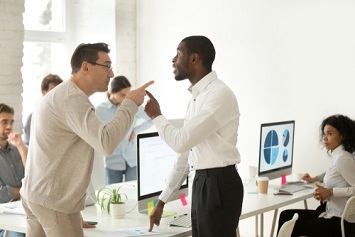 Typically, however, when most folks talk about workplace violence, they’re looking at what OSHA has identified as type three, and that’s coworker violence, and really, what’s fascinating, I think, is statistically, people are much more exposed to type one, outsider violence, the external, than they are internal. But in survey after survey, we asked folks in workplaces, in different industries, “When you hear about workplace violence, who are you most afraid of?” The answer almost always come back, the coworker, the current or former coworker. So when we look at that person, it’s fundamentally different than type one. Type four is the domestic violence which comes in, and that’s a whole other set of presentation, if you will, but at least for the next few minutes we’ll just focus on the most popular or the most concerning, and that’s coworker violence, and you really look at a person who acts in a hostile … They pull themselves out of the situation. They don’t participate meaningfully, they’re angry. If I were to look at maybe the top five indicators that I’m looking for, and again, it doesn’t make sense to only look at five, but you look at typically the person who’s got that simmering anger. If they’re not angry, they’re going to get angry, and they get angry because they take everything personally. They internalize it. One of the great authors in our line of business, a guy named Reed Malloy, has called them injustice collectors. I actually call them injustice initiators. They’ll create conflict. They’ll ruminate. They’ll obsess. In the process, they’ll start to develop that sense of, “I’ve been done wrong,” that victimhood. What I really pay attention to are indications of distress. Here’s another fundamental challenge in our business. We often get really hung up on this notion of did a person make a threat, and I’ll tell you, if somebody makes a threat, it affects their coworkers, it affects everyone around them. It changes our relationship. You can’t un-ring the threat bell, but we know from experience and statistics, most people who make threats never hurt anybody. Most people who hurt somebody never made a threat. Everyone who hurts somebody acted in a threatening way, so when we really start to talk about potential indicators of maybe growing potential for violence, we look at angry, the injustice collecting and creating, the blaming others, the lack of ability to engage meaningfully in problem-solving, a sense of desperation. Back in the old days, we used to call this helpless, hopeless, humiliated, but it’s really they tend to overreact to situations that we would otherwise, I guess, resolve fairly simply, but they just can’t get over things. They hold on, they ruminate, they obsess. That’s the throwing paint up against the wall answer. Clearly what we’ll do is we come back and we’ll dig through it more meaningfully, but in the workplace, we start to pay attention not necessarily to just the folks who make threats, because they disrupt the workplace, but people who act in an angry, hostile, aggressive, over-reactive, personalized manner, those are the folks that need to be on our radar. Justin Scace: Okay. Your session as the upcoming Workplace Violence Prevention Symposium is about the link between substance abuse and workplace violence. How do these workplace violence warning signs that we’ve been discussing right now, how do they compare with substance abuse warning signs? How do they overlap? Patrick Prince: At a fundamental level, they’re almost indistinguishable. When we look at this pathway to violence, people don’t just snap. They don’t just come in and engage in horrific acts of damage and homicide. There is a buildup. Now, sometimes it’s a fairly quick, maybe months, but there’s always the behavior. When we go back and look at what people in my business call, typically, low-grade behavior (hostile, belligerent, argumentative, the threatening, intimidating) in California, it’s actually against the law to engage in or allow abuse of conduct, whatever that means. When we look at that, those are very, very consistent indicators of that low-grade, but you can’t go to high without passing through low, so now go back to substance abuse. Belligerent, argumentative, overreacting, intimidating, argumentative, they’re virtually indistinguishable. As you’ve mentioned, I’ve worked thousands of cases. I believe in my heart of hearts, and I don’t have the hard data, but I’ve got decades of experience, I truly believe that in a majority of my cases, maybe only 55 or 60 [percent], but I believe if the company had engaged in for cause drug testing, had they addressed that kind of behavior, half my case load would go away. When I look at what generally brings me in the door, a fellow is threatening a coworker, he’s getting in his face, glaring at, staring down, intimidating, that’s substance abuse behavior, and at those levels, substance abuse and the pathway to violence are indistinguishable. So, let’s intervene early. If we wait until there’s an assault, if we wait until there’s a gross act, it’s too late. I really believe that one of the most effective early workplace violence prevention tools we have is for cause drug testing, because I truly believe well over half of the cases that everybody in my industry, across the country, more than half of our cases are really substance abuse cases. Here’s the ugly underside. It’s easier for a company to take action based on a positive drug test on an employee than to take action because an employee is scaring their coworkers. Let’s intervene where we have the opportunity. Let’s use the tools that are available. Mind you, 45 or 50 percent are not going to be substances, but the vast majority, at least early on, are substance-related. Justin Scace: Okay. One thing to consider, there are a lot of different substances out there. In your experience, does one type of drug abuse tend to predict violence outcomes more than others? We’re talking opioids versus stimulants versus alcohol … or are they all just different shades of the same problem? Patrick Prince: Yes and no. On one hand, I don’t want to say we only worry about one substance because that would preclude paying attention to others, and that would be foolish. Having said that, I gave a talk in 1989. I was doing the training for a school district, and the local police department, had 500 cops and teachers. 1989 I said the worst drug I’d ever seen is methamphetamine. Today, I will tell you that methamphetamine has more of an impact on our communities, on our families, on our healthcare system. We hear a great deal about opioid problems right now, and it’s a significant issue. It truly pales with meth. Having said that, meth has to get attention. Alcohol and meth, at some level, the behaviors are very consistent. The emotional outbursts, the over-angry types of response, the violent reactions. We know that alcohol probably more than all the others is related to interpersonal violence, things like that. We’ve changed the way we live our lives because of things like alcohol, and I’m not a prohibitionist. I don’t think organizations and companies certainly should get in that business. Think about it. We think twice about taking our kids to local football games. We think twice about going to parades. We think twice about doing things where there’s going to be a lot of folks because they get together, people drink, we know there’s going to be a fight, we know there’s going to be conflict. We just assume it in the outside world, and then when we see the same behaviors in a company, we somehow forget that link. And so part of what we want to do is, again, not make people overly cautious. We don’t want to get in the business of being prohibitionist, but pay attention to what’s right there, and let’s use the right tool for the right job. Drug testing is just a tool, but it’s a really, really effective tool.